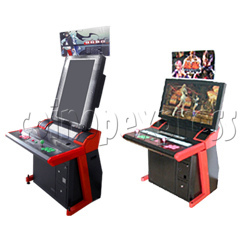 Modern LCD arcade cabinet with attractive outlook, made by durable metal cabinet and setup with 32 inch high resolution LCD screen, excellent choice for the latest jamma game system. I/O converter board are included, it can connect to Taito Type X, Taito Type X2, Naomi ... those latest game system easily. This game cabinet control panel can be folded to save shipping space. Two wooden layers set inside the metal base for pcb setup and related parts. Very easy to adjust game board as stereo amp switch, service and test button are installed on the front of this metal cabinet. The LCD monitor can be setup for "horizontal screen play" or "vertical screen play", very simple to change the screen to suit your favour games kit. Buy two or more cabinets for business, VS battle cables are provided for easy connection. It can linked up to 4 sets cabinet for multiple players. control panel can be folded for dispatch - to save shipping space.